1. Make apple butter: Preheat oven to 350 degrees F / 180 degrees C. Peel, core, and cut the apples using a mandolin. Combine the apples, sugar, salt, vanilla paste, lemon juice, and spices in a ovenproof sauté pan and cook over medium-high heat, covered, until apples are soft. This should take about 10 minutes. Pour the softened apples into the Vitamix (or food processor) and blend until very smooth. Pour the mixture back into the same sauté pan and bake until it browns and thickens. Be sure to watch carefully, stirring every 10minutes or so to prevent burning. The final baking process should take roughly 45minutes. 2. Make puff pastries: Sift the flour and salt into a large bowl. Roughly break the butter in small chunks, add them to the bowl and rub them in loosely – there should still be visible chunks of butter. Make a well in the bowl and pour in about two-thirds of the cold water, mixing until you have firm rough dough, adding extra water if needed. Cover with plastic wrap and leave to rest for 20 minutes in the fridge. Once chilled, turn out dough onto a lightly floured board, knead gently and form into a smooth rectangle. Roll the dough in one direction only, until 3 times the width. Keep edges straight and even. Don’t overwork the butter streaks; you should have a marbled effect. Fold the top third down to the center, then the bottom third up and over that, like an envelope. Give the dough a quarter turn (to the left or right) and roll out again to three times the length. Sprinkle the cinnamon sugar over the dough and fold in thirds as before, cover with plastic wrap and chill for at least 20 minutes before rolling to use. 3. 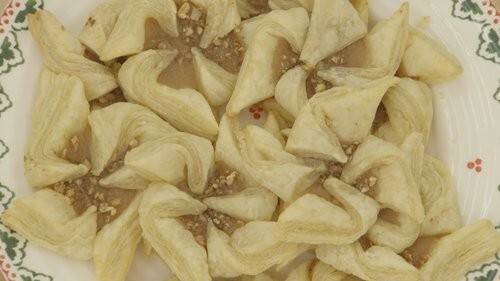 Make pinwheels: Remove dough from refrigerator, divide dough in two (return one half of dough to the fridge), and use a rolling pin to roll out one half of the dough into a 12-inch square on a lightly floured board; cut into nine 4-inch squares. Transfer squares to a baking sheet lined with parchment paper, and dollop 1tbsp of the apple butter into the center of each. With a knife, cut each corner of the squares diagonally toward the center, only just until the filling. Fold every other corner inward, on top of the filling, until you have a pinwheel shape. Repeat with remaining dough and filling. Place the pinwheels in the oven at 400 degrees F / 204 degrees C and bake for 15-20 minutes, or until the edges start to puff and brown. Remove and let cool a bit before icing. 4. Make lemon icing! In a medium mixing bowl, whisk together the powdered sugar, melted butter, lemon juice, and vanilla paste until smooth. Add in water if too dry. Drizzle icing over the pinwheels in a zigzag fashion. 1. Make puff pastries: Sift the flour and salt into a large bowl. Roughly break the butter in small chunks, add them to the bowl and rub them in loosely – there should still be visible chunks of butter. Make a well in the bowl and pour in about two-thirds of the cold water, mixing until you have firm rough dough, adding extra water if needed. Cover with plastic wrap and leave to rest for 20 minutes in the fridge. Once chilled, turn out dough onto a lightly floured board, knead gently and form into a smooth rectangle. Roll the dough in one direction only, until 3 times the width. Keep edges straight and even. Don’t overwork the butter streaks; you should have a marbled effect. Fold the top third down to the center, then the bottom third up and over that, like an envelope. Give the dough a quarter turn (to the left or right) and roll out again to three times the length. Sprinkle the lemon zest over the dough and fold in thirds as before, cover with plastic wrap and chill for at least 20 minutes before rolling to use. 2. Make jam: Line a 10x15 jelly roll pan with parchment paper. Puree raspberries in food processor until almost all seeds have been ground up. Place pureed raspberry into a medium sauce pan over medium heat, and then stir in sugar and lemon juice. Bring mixture to a simmer and let reduce for 10-15 minutes, stirring often. Once the jam reaches a syrupy consistency, remove from heat and stir in 1 tbsp butter. Run jam through a mesh strainer to rid of the seeds and onto parchment-lined pan and place in refrigerator to cool. 3. 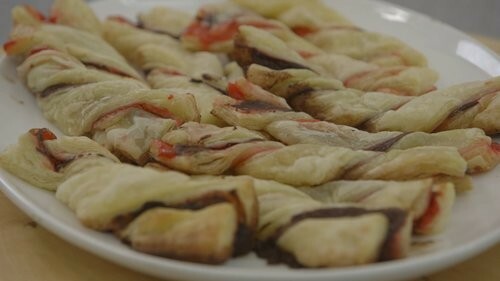 Assemble: Roll out the puff pastry into 2 separate rectangles. With a pastry brush, coat one piece of puff pastry with half the jam. Cover jam-coated piece with the remaining plain piece of puff pastry and gently pat together with your hands. Next, slice into long, 1-. inch width strips and twist, and then place on parchment-lined pan. In a preheated 400 degrees F / 204 degrees C, bake for 15 minutes or until golden brown. Let cool before removing from the pan. Sprinkle with powdered sugar for presentation.